Just four days before the opening ceremony of the Olympic Games, on Monday 08/04/2008 at about 08:00, 16 Chinese policemen have been killed in an attack on a border post in the restive Muslim region of Xinjiang, in North-West China on the border with Russia. Another 16 policemen were injured. 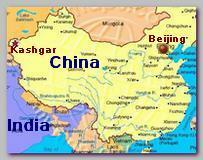 Both attackers were captured during the raid near the city of Kashgar, Xinhua Chinease news agency reported. Also last week, Col Tian Yixiang of the Olympics security command centre warned that Islamic separatists were the biggest threat to the Olympics. The warning came after a group called the ‘Turkestan Islamic Party’ said it had blown up buses in Shanghai and Yunnan, killing five people.